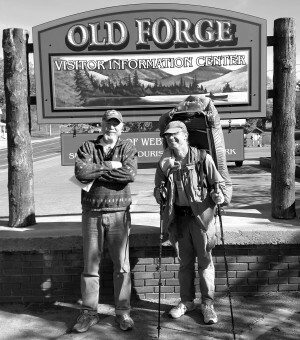 Old Forge was the gathering point on Thursday morning, October 8 for cross-country travelers Frank Heili and Ed Talone. Heili, of Kansas City, MO, stopped by on his drive to the Atlantic coast. Talone, of Maryland, is hiking the 4,600-mile North Country National Scenic Trail from Lake Sakakawea State Park in central North Dakota to Crown Point, NY. He was particularly interested in the TOBIE Trail and any trails and roads that were once railroads. Talone started his trek this year in March and he’ll follow the Uncas Road from Eagle Bay to Raquette Lake on the way to Crown Point. He will finish his walkabout in Rutland, VT.
“I’ve hiked more than 700 rail trails across the country,” he said, adding that he very much enjoys historic trains, as well. Written by: Mike Farmer on October 8, 2015. Last revised by: Gina Greco, our reviewer, on November 16, 2015. This entry was posted in admin and tagged cross country travelers on October 8, 2015 by Mike Farmer.